This update from the Substance Abuse and Mental Health Services Administration (SAMHSA) reports trends in the use of methadone, buprenorphine, and extended-release, injectable naltrexone—an option for treating opioid use disorder. Not included in the report are data from private physicians who aren’t affiliated with a treatment facility or program. Paralleling the recent increase in deaths from heroin and other opioids, the number of opioid treatment programs (OTPs) and other medication-assisted treatment options for preventing such tragedies has also risen. The figure below summarizes key information from the August 22 CBHSQ Report, a SAMHSA publication. Alderks CE. 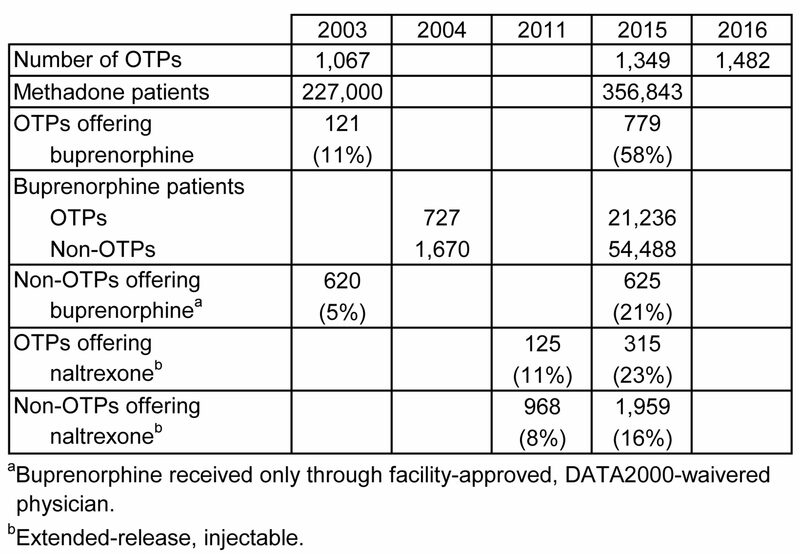 Trends in the Use of Methadone, Buprenorphine, and Extended-release Naltrexone at Substance Abuse Treatment Facilities: 2003-2015 (Update). The CBHSQ Report: August 22, 2017. Center for Behavioral Health Statistics and Quality, Substance Abuse and Mental Health Services Administration, Rockville, MD. https://www.samhsa.gov/data/sites/default/files/report_3192/ShortReport-3192.pdf.